Jo Giroux is a personal trainer, weight loss consultant and nutritionalist. She also runs the fabulous Park Fit class that I attend every Monday in the Derbyshire Dales. Jo is a wonderful trainer, incredibly motivating in the face of mass cynicism and has really helped bust my body back into a recognisable shape. Jo has kindly posted about the best ways to shed fat while exercising. I’m often asked what’s best for fat loss or weight loss, and it’s a been the hot subject for years. As somebody that runs, I’m a big running supporter. But for fat loss? No. It’s resistance and HIIT training that’s key. I hear the same thing time and time again – “I want to lose weight but I hate running”, ” want to shift a stone so I’ve started going running”. If this sounds like you and your goals then read on. It’s very easy to assume that running will single handedly shift the pounds because you see how many calories you’ve just lost on your little running app or watch and think that’s it. 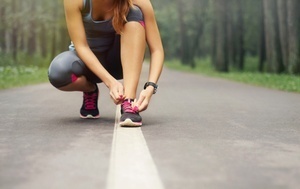 The thing with running though is once you stop, so does the calorie burning. There is very little Exercise Post Oxygen Composition (EPOC) with running (or any other steady state cardio) – so you only burn calories whilst you run. There is no doubt that you’ll burn calories, which is fab, but it will take longer. You see that woman (lets use a woman for this scenario) who runs and runs and runs, has slim hips, lean muscles etc etc. Trust me, she’s been running for years, probably since school. And she’s like that because of her GENETICS. Not because she runs for hours on end. Don’t compare yourself to that woman – you won’t get her figure because we’re all different. It’s about being the best YOU can be. So in Park-Fit we do a lot of High Intensity Interval Training (HIIT) and there’s a reason for that. When it comes to efficient calorie burning HIIT is leaps and bounds ahead of standard cardio. Why? EPOC! That thing I mentioned before. When you do HIIT your body and metabolism function at a higher rate of burned calories for hours and hours afterwards. What does that mean? It means that whilst your sitting with your coffee post Park-Fit you’re still burning calories. HIIT forces your heart to adjust to the changing conditions: sprints, hill runs, fast feet etc. Your heart learns to operate outside its norm, and your body learns to adapt to these changes. All of this changing and sprinting kicks your metabolism into high gear for hours after you’ve finished exercising. Studies have shown that participants who did integral training as opposed to steady continuous exercise lost THREE TIMES the body fat. I’d take that option every time. The bad thing about HIIT is that it’s exhausting. Your body wants to give up after 20 minutes and it takes time to recover. So where does resistance/weight training come into it? Simply put, the bigger the muscle, the more calories it needs to work and keep being efficient. Big doesn’t mean you’ll turn into Arnie – as women we don’t have the physical capacity to get like that. But we can become lean. Which exercises in particular are best suited for weight loss? Exercises that recruit the largest number of muscles – squats, lunges, burpees, kettlebell swings, push-ups etc. Hence the reason I like to do these most sessions. Get them in your workout, mix it in with some HIIT and you’ll build muscle and burn calories at an accelerated rate for hours after you’ve finished. This is all good and well, but if you don’t eat properly all the above means nothing. Eat right, eat real foods. Don’t miss meals – you may see weight loss but not necessarily FAT LOSS. If you skip or miss meals your body will hold onto its fat stores, resulting in a weaker metabolism. If you want advice about your food – just ask. I’m happy to help whether you come to a Park-Fit class or not.